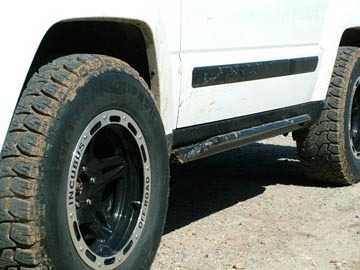 Rocky Road's Liberty Rock Sliders are the creme' de la creme' of the Jeep rocker protection phenomenon. We use 1/4" inner hitch steel to make sure your bars do NOT bend! Anything else is just plain flimsy. 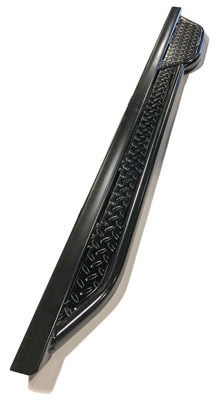 Most other rocker bars are made from thin 1/8" wall material and a good number of the Rock Sliders we sell are to those who have bought these thinner bars and have bent them up. At 3/16" thick, ours are the absolute strongest rocker protection you can buy in the universe. and the KJ Liberty behind him runs the RRO Supersliders too. That's one highly intelligent trail crew! Jeep Liberty Rock Sliders, Best engineered! The Jeep Liberty Rock Sliders have a very sleek rounded look about them as we use genuine inner hitch steel in their construction. Jeep Liberty Rockrail kit, Strongest Design! Because we wouldn't trust anything less to protect our Jeep and neither should you! Besides, since these carry the Rocky Road **lifetime guarantee**, we don't want to have to replace them for you for free every couple years or so. Rocky Road kits tuck tight and high for maximum clearance. 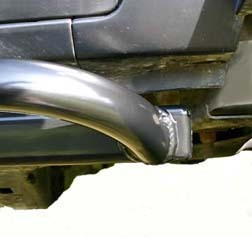 Our Supersliders provide an additional outer slider tube as pictured. Great for extra side protection on or offroad. Picture is of Superslider kit with the extra side protection. Click for larger view. 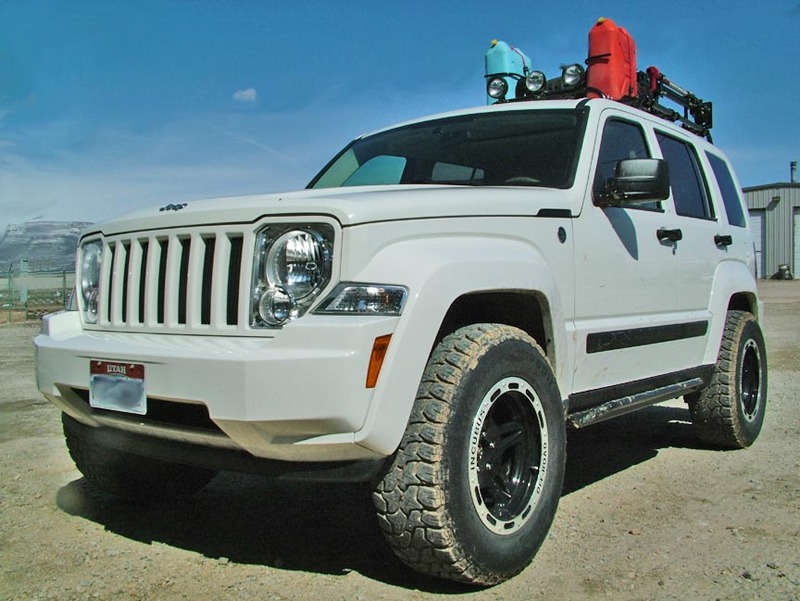 Jeep Liberty KJ/KK Rock Slider kits, Best Looking! 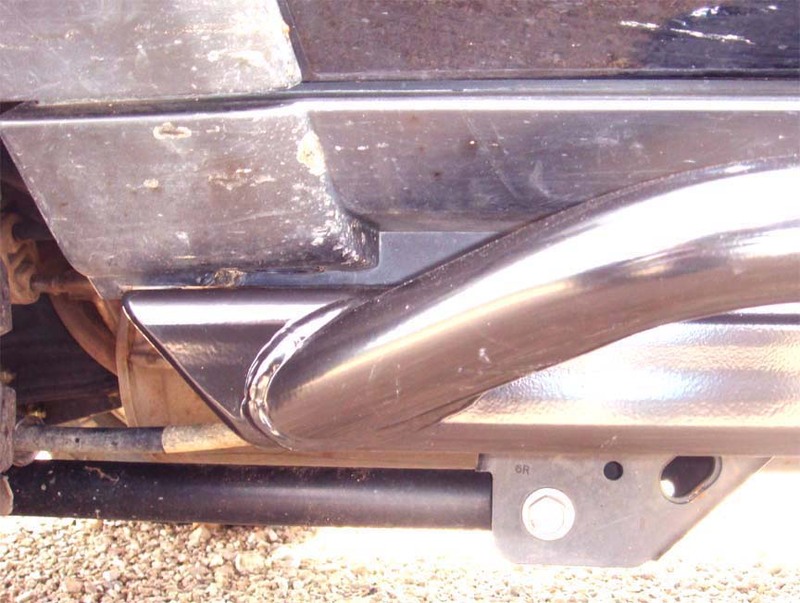 Our rock sliders are very simple to install and are completely 'bolt on'. They mount on the sub-frame as well as along the body seam. Not mounting along the entire seam causes extreme stress with the leverage of an impact on the outer rocker itself. Our design distributes the load across a broad area instead of focusing it on small spots. Pictured at right is an example of an engineering detail of the Rocky Road Rockrail kits over others on the market. Now take a look at the lower picture at right. This is from a competitor. Similar pricing for the rocker kits, but they cut their production costs by making the end a blunt square. Run that thing into a rock and you can clearly see the trouble you will face. Its a battering ram, not a rock slider. It could stop your vehicle cold or require you to bash away until something gives. Why would they build their kits with this engineering defect? Simple... its cheaper to manufacture with the flat end, so that's what they go with. You'll find our Liberty Rock Sliders are very attractive and will blend in nicely with your stock flares and moldings. They run fender to fender and many folks have commented on their very OEM (factory) look. They tuck tighter to the body than any other rocker on the market as well. In a nutshell, Rockrails are the strongest and thickest bars on the market, best mounting system, and are guaranteed NEVER to bend. Why wouldn't you get a set? Rockrails available for 05+ model Libertys. Please make sure to note your year of Rockrail during purchase is it is a different product. Older model Rockrails will not fit properly. Superslider shot on an 02 Jeep Liberty. Click for larger image. 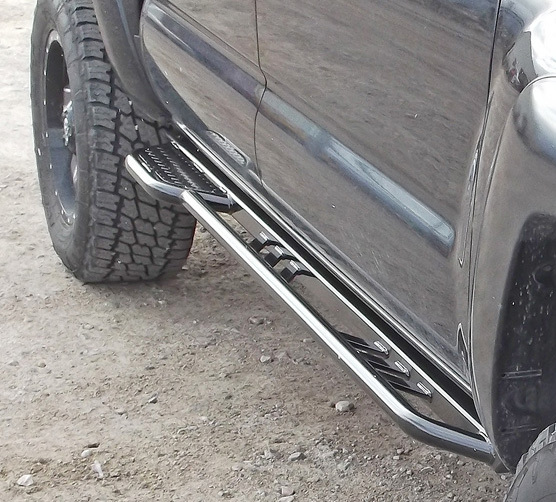 Jeep Liberty Superslider rock sliders. They also make an excellent step for access to roof racks and such. The Supersliders are replacing the Steprails that were once available. Jeep Liberty Kicker Rock Slider kits! Same great mounting strength and overall design as our Superslider kits, but with that extra rear kick-out section in back. For years these have been hugely popular with the Toyota guys, and now Rocky Road is finally bringing them to Jeep people! Picture of Supersliders on a new KK Jeep Liberty. Picture of our Superslider shown from above.